Sets in Step friends and family are sad to announce the death of Bill Rathfelder. Bill was born in Los Angeles, the eldest of three children of Charles and Lillian Rathfelder. He attended LA City College and later transferred to UCLA, majoring in aeronautical engineering. He and his wife Dorothy had two sons, David and Robert. Bill worked briefly for Century Engineers and then moved to Lockheed, as a designer/drafter. Over his long career at Lockheed, he worked on a multitude of different types of aircraft, and airplanes were a lifelong interest. He also was an avid beekeeper and grower of orchids. Bill attended Mount Olive Lutheran Church in La Crescenta, and was active in many things including playing hand bells and choir. After his wife's death, he took up square dancing. Bill was a graduate of Sets in Step's 2012 class, and was a regular at the club as Marguerite's partner. Bill passed away peacefully in Glendale, CA on March 26th, surrounded by his family and loved ones. The square dancing community will miss him. 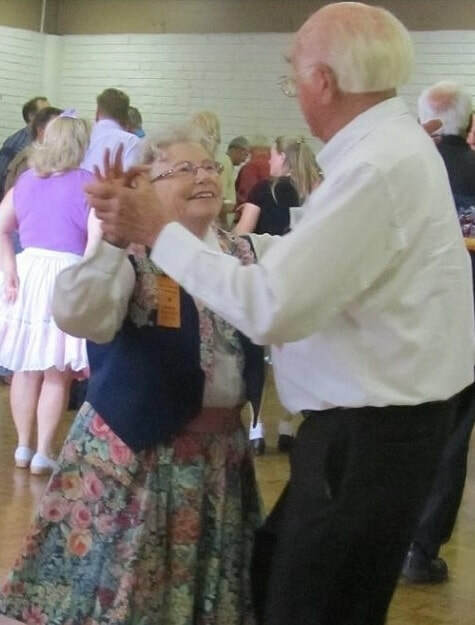 Sets In Step, and the whole Square Dancing community, have lost a good friend. Charles Brandt was taken from us at a much too early age, on August 1, 2018. He was born in Evansville, Indiana, and grew up in Mesa, Arizona, and Glendale, California, graduating from Herbert Hoover High School. Charlie started to go to square dances with his parents Melvin and Carrie Brandt as a child, and decided to take it up himself as a teenager. He was a wonderful dancer, able to do both the men’s and ladies’ parts with ease. Charlie developed Diabetes in his early 40’s, and unfortunately because of it he became legally blind. But with his amazing memory and many years of square dancing behind him, that wasn’t enough to stop him from continuing to be a great dancer. He joined Sets In Step in 2013 and immediately became a favorite in the club. He was always ready to help be an angel at the classes, or announce upcoming dances at visits to other clubs or be host at our after dance meetings. In June 2017 he was voted in as Co-President of the Club and was still serving in that capacity that at the time of his death. Charlie had a history of heart problems and in June of 2018 had a pacemaker/defibrillator inserted to help his heart beat properly. Unfortunately, there must have been too much damage to the heart and he passed away quickly in his new home at Broadview Residence for the Retired. He was preceded in death by his mother in 1985, followed by his father in 1995, and his oldest sister, Carol, in 2003. He is survived by his twin sisters, Nancy and Barbara, his beloved Aunt Angless, and numerous nieces and nephews. The family have suggested that in lieu of flowers, donations be made in Charlie's memory to the Braille Institute. We will always remember Charlie for his intelligence, good humor, willingness to help in whatever way he could and dedication to Square Dancing. All of his friends in the Square Dance World will miss Charlie and will remember him with love. There will be a memorial celebrating Charlie's life on Friday, September 7th, preceding our dance that night, starting at 6:00 PM, at the Knights of Columbus in Montrose. A light potluck supper will be served; please contact Connie Yeseta to let her know what you can bring to share.